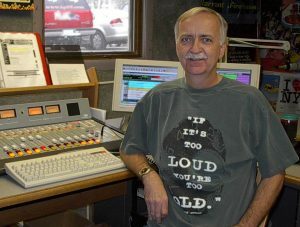 Steve began working in radio as a sophomore in high school at WBIZ in Eau Claire, WI, doing miscellaneous jobs around the station, assisting with sports broadcasts, and operating the station on Sunday mornings. His on air duties expanded as he attended the University of Wisconsin in Eau Claire as a mass comm major. He continued his broadcast education at Brown Institute in Minneapolis and received a fulltime radio position in Missoula, MT, upon graduation. His career eventually took him to Sioux City, IA, where he worked at two different radio groups. Eventually he found his way to a station in Phoenix. He is now retired and spends summers in Iowa, near his daughter, and winters in Phoenix where he remains active in broadcasting on a volunteer basis.